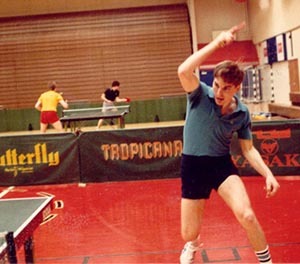 Welcome to TableTennisCoaching.com, your Worldwide Center for Table Tennis Coaching! This is an evolving website and Table Tennis Community. Your suggestions are welcome. Want a daily injection of Table Tennis? Come read the Larry Hodges Blog! (Entries go up by noon, Mon-Fri; see link on left.) Feel free to comment! Want to talk Table Tennis? Come join us on the forum. While the focus here is on coaching, the forum is open to any table tennis talk. Want to Learn? Read the Tip of the Week, study videos, read articles, or find just about any other table tennis coaching site from the menu links. If you know of one, please let us know so we can add it. Want to Learn more directly? There are two options. See the Video Coaching link for info on having your game analyzed via video. See the Clinics link for info on arranging a clinic in your area, or finding ones that are already scheduled. If you have any questions, feel free to email, post a note on the forum, or comment on my blog entries. For those that missed it, yesterday I did a special on the Teams, with links to articles, tips on how to play well, and video. Don't be a turkey; read and watch all of it! 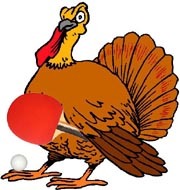 Players who are turkeys develop very strong forehands and weak backhands, or vice versa. Sometimes their weaker side isn't really that weak, it's just not that strong. If you have a weaker side, why not make it a goal to turn your weak/average/somewhat strong side into an overpowering strength? You can do it; simply choose not to be a turkey. Teaching the forehand pendulum serve is easy. Most relatively new players learn to do it with backspin and sidespin-backspin without too much trouble. But serving it with sidespin-topspin? This might be the single most difficult thing to teach. It's like teaching someone to whistle - at first they try and try, and nothing seems to work, and they get frustrated. And then, suddenly, it just happens, and then they get it, and from there on it's no problem. The same is true of this serve; players often struggle and struggle with it, which is frustrating to the player and the coach. And then, it just suddenly happens. I'm not sure why this particular skill is so much trickier to teach than other skills. You'd think that teaching a loop would be harder, but I've found that's much easier in practice. It's tough playing a quicker player who bangs every shot before while you're still following through on your previous shot. But a lot of players don't understand that on the first shot of the rally, especially on your serve, you can rush the quicker player. It just comes down to setting yourself up for a shot you can attack quickly, before the quick opponent can get into a quick rally. If you place your first quick attack well, the quicker player will have great difficulty and won't be able to rush you - and you'll get a second shot to attack. Why do so few intermediate players serve short to the forehand? Perhaps as beginners they couldn't keep it short, and didn't want to serve to the opponent's forehand. And so the habit of serving to the backhand stuck. But a short serve to the forehand, especially with sidespin-topspin, is about the easiest way to get a set-up against most intermediate players. Many or most players will return short serves to the forehand almost always toward the forehand side (for righties), since it's awkward going down the line for many. This makes serve and attack very easy. Why not develop this for your game? I was hitting with a relatively new student yesterday, an eight-year-old girl, who was having trouble timing her shots. I did something I've done before - I may have blogged about this a while ago - and started to say, "Da-da, da-da, da-da, da-da" as we hit, timing each "da" with the ball hitting the table or the racket. This greatly helped her timing. When I stopped doing it, she protested, and made me do it for about ten minutes. Finally, I switched to saying other things, like "No more, no more, no more, no more," and "Don't miss, don't miss, don't miss, don't miss," which she thought was pretty funny - but it also worked. Here's a simple drill that covers four basic skills in three shots. Your partner serves short backspin anywhere on the table. You push it back short anywhere - try and hide the direction and at the last second maneuver it somewhere on the table short. Your partner quick pushes to your backhand. You backhand loop (or drive) crosscourt. Your partner blocks crosscourt. You step around and try to end the point with your forehand. You've practiced your short push, your backhand loop, your step around backhand footwork (as well as other footwork for the other shots), and your forehand. Variations: You can backhand loop anywhere, and then it's free play. Or instead of stepping around with a forehand, you can try to end the point with your backhand. Or backhand loop down the line, partner blocks or counterloops to your forehand, you loop/counterloop, and it's free play. Or any other variation you can think of that fits your game, or how you want to play. Forehands from the Backhand Corner. 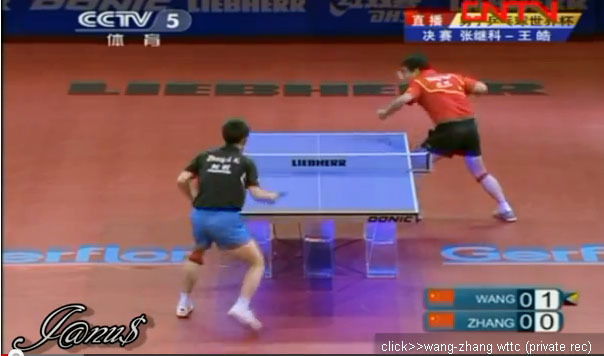 Here's Wang Hao against Zhang Jike in the final of the Men's World Cup this past weekend. Over and over Wang's serves are blatantly illegal. And yet, in one of the biggest matches of the year, with huge numbers of spectators (live or online), with coaches, players, and up-and-coming juniors watching, the umpires very publicly do not call it.